Rep. Mindy Fee, a graduate of Manheim Central School District and lifelong resident of the Manheim area, has brought more than two decades of small business experience with her to Harrisburg. Relying on her understanding of the private sector, Mindy’s main goal is to restore security and prosperity to Pennsylvania’s economy. She is focused on creating policies to support private-sector job creation and a pro-business environment. Mindy’s priorities for representing the 37th District include reducing the cost of state government, while maximizing transparency and access. She has a no-nonsense conviction to government fiscal sanity and will fight for on-time, balanced budgets, stamping out wasteful spending and holding the line on taxes. 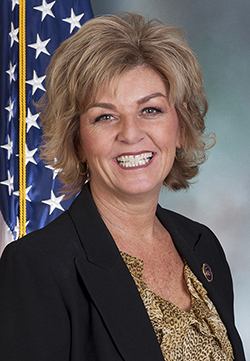 In the current legislative session, Mindy is a member of four House committees: Agriculture & Rural Affairs, Game & Fisheries, Labor & Industry, and Transportation. Understanding the importance of agriculture to Pennsylvania’s economy and Lancaster County’s way of life, Mindy will support policies to preserve and support family farms. Agriculture is Pennsylvania’s No. 1 industry, and it is the backbone of Lancaster County’s wholesome character. As the voice of the 37th District in Harrisburg, Mindy will deliver the people’s values and morals to the Capitol, including a belief in rights for the unborn, defense of traditional marriage and support of Second Amendment rights. Mindy holds a degree in economics from Millersville University. She is a member of the NRA, is active in her church, and has provided volunteer service to many groups, such as the Manheim Central School District Booster Club and the Manheim Downtown Development Group. She is a former employee of TransAmerican Office Furniture Inc.
Mindy is the widow of Tom Fee, former district judge and mayor of Manheim. She has three children, Danielle, Ryan and Abby. The 37th District includes the townships of Clay, West Cocalico, Elizabeth, Mount Joy, Penn, East Hempfield (portion) and Rapho and the boroughs of Denver, East Petersburg and Manheim.